Terrorizing activists and truth-tellers via "lawfare"
Martha Stout, a leading expert on psychopaths, says that the single most characteristic sign of the psychopath is the way they “play the victim card” while victimizing others. 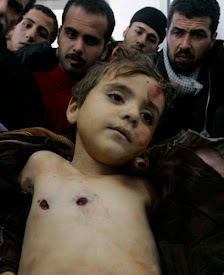 Case in point: Israel, the Psychopathic Nation: a bunch of invaders, looters, and genocide perpetrators who claim that THEY are the eternal victims. 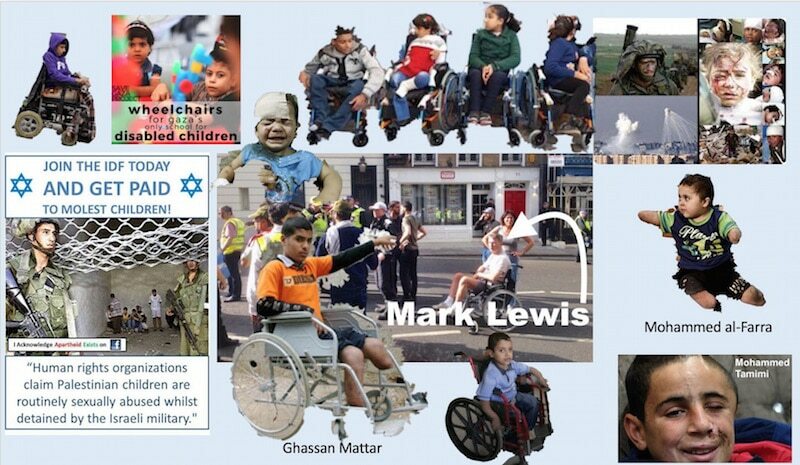 Another case in point: wheelchair-bound ultra-Zionist lawyer Mark Lewis, who works overtime to put Palestinian kids in wheelchairs too, by doing everything he can to support the genocidal Zionist entity that is shooting them down by the scores with exploding bullets designed to kill or inflict permanent disabilities. Lewis is behind much of the “lawfare” program described in Eve Mykytn’s article below—a political strategy aimed at crushing and bankrupting pro-Palestinian voices that relies on the notoriously pro-plaintiff bias in British libel law. Lewis apparently purchases legal insurance that guarantees that lawyers for plaintiffs in libel cases will get paid a flat fee, regardless of outcome—and applies that insurance program to a witch hunt against critics of Israel and Zionism. (No such insurance is available for libel defendants.) The result is that Zionist associates of Lewis have been combing the media for statements by pro-Palestinians that could be punished via libel cases, then contacting the “victims” and offering pro bono legal services. It’s a lot like the common sleazebag lawyer practice of ambulance chasing, only in this case it is designed to punish political speech criticizing a powerful lobby. 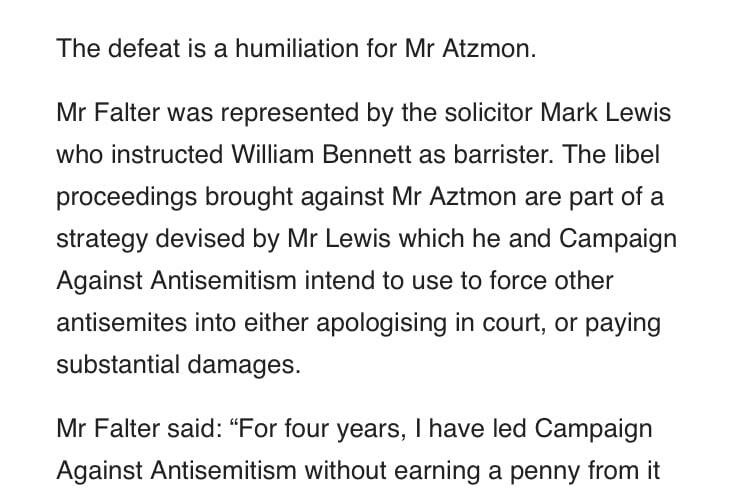 In the libel case against Gilad Atzmon described below, the plaintiff, Gideon Falter, originally asked for somewhere between 45,000 and 60,000 pounds damages—then offered to settle for 7,500 pounds. Normally settlement offers are in the neighborhood of 75% of the original demand. Why did Falter (presumably advised by his lawyer) lowball his initial settlement offer? One likely reason: they didn’t want the CAA program to be exposed in court. Another reason: Falter’s lawyer is guaranteed a flat fee by Lewis’s legal insurance arrangement or alternatively by the defendant, so he makes the same amount of money whether or not he actually litigates the case, and whether the settlement is huge or paltry. Abbott ran afoul of the CAA when she said: “It’s a smear to say that Labour has a problem with anti-Semitism. It is something like a smear against ordinary party members.” The CAAclaimed that “Abbott’s comments were widely condemned. The overwhelming majority of UK Jewish community bodies have expressed public concern about anti-Semitism in the Labour Party, including the chief rabbi.” Whether or not this statement is accurate, how is it that Abbott’s statement was misinterpreted as a criticism of Jews when it is clearly a defence of the Labour Party? 4. While the CAA’s audit of anti-Semitism shows a nationwide rise of 14.9 per cent in anti-Semitic incidents between 2016 and 2017, this is based on data gathered by the CAA half of which shows wild year to year fluctuations of up to 1050 per cent. Such fluctuations defy any rationale. These statistical anomalies beg careful analysis that the CAA not only fails to apply – the CAA fails to address this drastic shift in number of reported incidents. The CAA’s study aggregates divergent data collected in different ways and calls that an “audit” of anti-Semitism in Britain. The flawed study was released to the British public with the help of the disgracefully gullible British media. The BBC, Sky, the Guardian and others reported the amateurish statistical “audit” to the British public without raising a single question as to its reliability. The CPS declined to prosecute Turner’s speech as incitement to racial hatred. There is an “incitement to racial hatred” clause in the statutes but it is not all-encompassing, and it did not come close to making “anti-Semitism” illegal. The CPS’s policy guidelines on casesinvolving “incitement” clearly state that the language employed by a defendant must have been “threatening, abusive or insulting“. The courts have upheld the right to freedom of speech even when behaviour is, as in this case, “annoying, rude or even offensive without necessarily being insulting”.